Home » News & Press » New San Francisco’s Ultimate Tribute to Journey Website Launched Today! New San Francisco’s Ultimate Tribute to Journey Website Launched Today! Posted by admin on 01/20/2012 | Comments Off on New San Francisco’s Ultimate Tribute to Journey Website Launched Today! Welcome to the new San Francisco’s Ultimate Tribute to Journey Website! We hope you like it and look forward to hearing your feedback. New features of the website include a main slider on the Home Page which will showcase San Francisco’s Ultimate Tribute to Journey’s latest video and Special “not-to-be-missed” Events. Also on the Home Page, we’ve included a nifty calendar where you can see where San Francisco’s Ultimate Tribute to Journey is playing next. By clicking on the Show date, you can get all the details which include an integrated Google map to the venue and a link to pre-sale tickets (when available). The Shows Page will also give you the ability to leave a comment about the show. So, let us know if you’re coming or what you thought of the performance after the show. The new San Francisco’s Ultimate Tribute to Journey website is equipped with all the latest Social Network sharing capabilities! “Like” a News Article or Upcoming Event? Then share it with your Socialites via Facebook, Twitter and Google+ with one simple click. The share buttons are abound. So… click ‘em people! The new San Francisco’s Ultimate Tribute to Journey website is equipped with a fancy Music Player. The “main” player is located under the Audio page and a scaled-down version is included on all of the pages of the website. Just be sure not to surf off of the page if you are jammin’ out on one of the songs. With the popularity of YouTube at an all-time high, we have decided to use YoutTube exclusively on the new website. Over time, new videos will be added to the site and included in News & Press Pages and even in some of the Show Pages! You can also visit the Official San Francisco’s Ultimate Tribute to Journey YouTube Page by clicking on the YouTube icon at the top-right of the website. Want to keep up-to-date with all the latest happenings with San Francisco’s Ultimate Tribute to Journey? Then join our Newsletter! Newsletter Subscribers will be eligible to receive Exclusive Announcements and FREE tickets to upcoming shows. 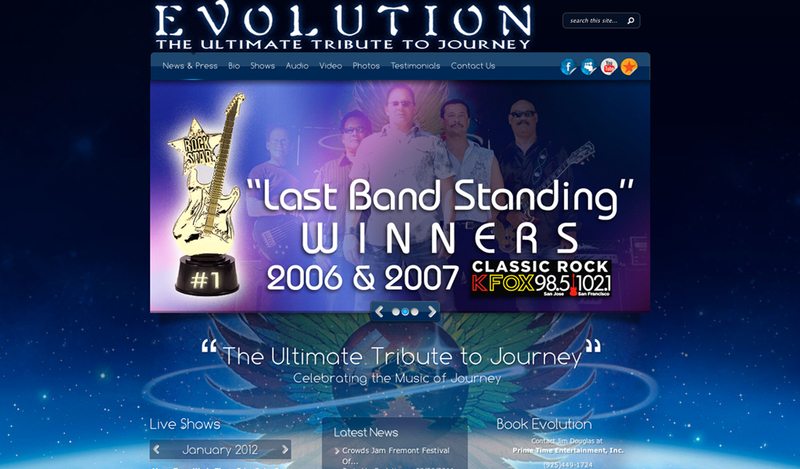 GINGALLEY Web Design & Promotions is proud to have San Francisco’s Ultimate Tribute to Journey as a new Web Client. Although we have created multiple poster designs in the past for the Band, we haven’t worked that closely on any other projects. We must say that it was a pleasure working with Jerrol, Don and Jim Douglas of Prime Time Entertainment on the new website and look forward to a long-lasting relationship with San Francisco’s Ultimate Tribute to Journey. We wish them much success and are here to help see that happens!